We’ve known for a while that Bethesda’s got a new game that they’re going to be showing off at E3. We, like many of you, have been not-so-secretly have been hoping it would be Fallout 4. Sorry chaps, it’s not. In a press release sent yesterday, the company unveiled its brand new game – a stylish, stylised game set in an alternate universe’s World War. Interestingly, it’s not a shooter. Nor is it an RPG. It’s a 32 player online, mostly-melee brawler. Well that sounds interesting. Oh, and it’s free to play. 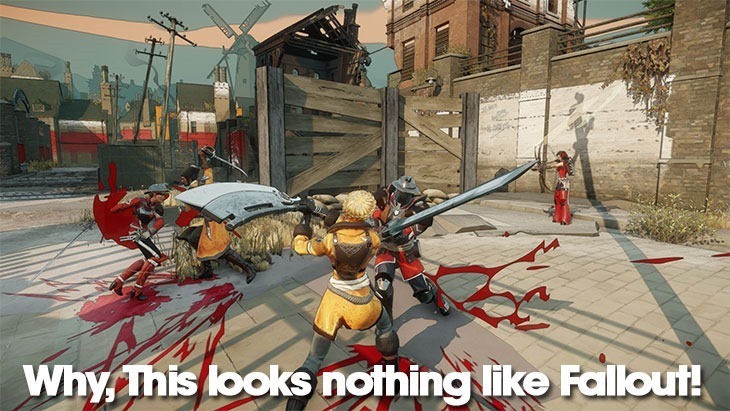 “The BattleCry team is happy to unveil the game that bears our studio’s name,” read the press release. The game’s creative director is Viktor Antonov, you might recognise as being the chap who helped create the distinctive worlds for both Half-Life 2 and Bethesda’s Arkane-developed Dishonored. The game certainly has an unusual visual flair. It’s essentially Bethesda’s take on Team Fortress, though it’s focuses more on close-up encounters than shooting things in the face. It’s a close-quarters war between the Royal Marines and the Cossack Empire; each outfitted with its own classes, each of those in turn with its own unique abilities. Here’s the reveal trailer. The game’s getting a beta next year, but we’ll get some hands-on with the thing next month. Tell us what you think.